← Chasewater Railway Museum – Help Required! 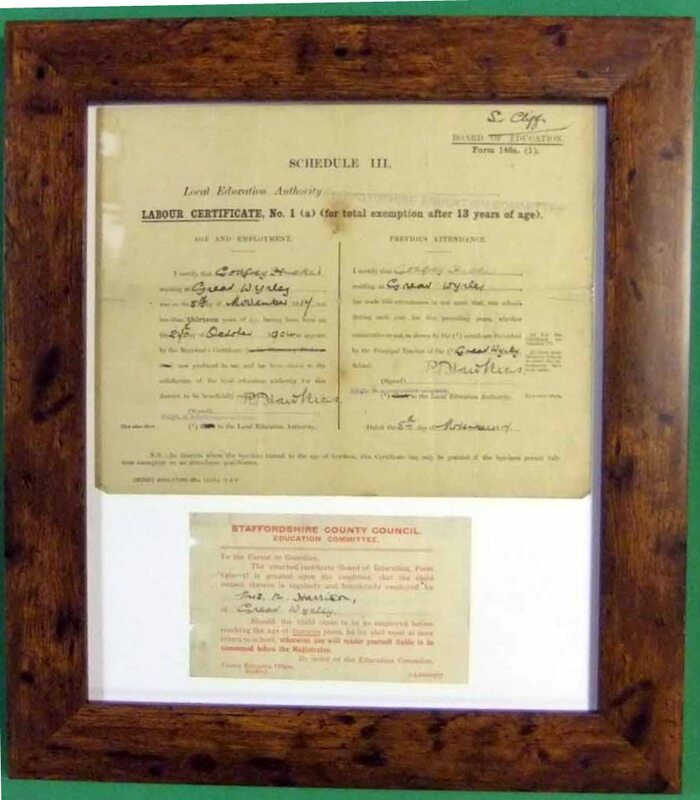 Another recent addition to Chasewater Railway Museum, following the local Colliery connection with the Railway, is an old Labour Certificate, which as been framed. This certificate was donated to the Museum by Godfrey Hucker, one of the Museum volunteers. The certificate was issued to his father, also named Godfrey in November 1917, by Staffordshire County Council Education Committee, allowing him to leave school at the age of 13, and commence working at the Grove Colliery in Great Wyrley. The Grove Colliery ceased to mine coal in 1930, following an explosion which killed 14 miners. Following the disaster (a report of this can be found on Brownhills Bob’s Blog) the Grove then used their surface equipment to wash, screen & distribute coal from the adjacent colliery, Wyrley No 3 known as the Sinking. Godfrey worked at the Grove until closure in the 1960’s. This entry was posted in Museum Exhibits and tagged Aldridge, Bloxwich, Brownhills, Burntwood, Cannock, Cannock Chase, Chasewater Railway Museum, Cheslyn Hay, Great Wyrley, Grove colliery, Hazel Slade, Heath Hayes, Hednesford, Labour Certificate, Lichfield, Norton Canes, Pelsall, Staffordshire, Walsall, Walsall Wood, Wolverhampton. Bookmark the permalink.